That teaser from the jacket cover of Jerome Charyn’s Joe DiMaggio: The Long Vigil (Yale University Press, $24) is never detailed. The author is intent on showing that agent and hero worshipper Morris Engelberg lured DiMaggio into the hobby show circuit. DiMaggio protested signing “Yankee Clipper” when people purchased his autograph. If a dealer angered DiMaggio, the Hall of Famer would storm away, ending the autograph session. However, the author doesn’t bother detailing how many memorabilia shows DiMaggio attended. He never quotes a single show promoter or someone who paid and stood in line for a signature. He quotes Engelberg saying that a signed DiMaggio item could bring anywhere from $150 to $2,000 wholesale. It would have been simple to find out how much a hobby show sold Yankee Clipper autograph tickets for. How much did a promoter pay for a DiMaggio appearance — and how much did Engelberg keep? I remember twice during my work at Sports Collectors Digest that show promoters faced DiMaggio meltdowns. Someone asked for a signature on a photo or magazine picturing him with Marilyn Monroe. Later advertisement warned attendees that these items would not be signed. The chapter notes that DiMaggio hinted that his hobby show fees were meant to help support his two granddaughters. Also, DiMaggio gave autographed bats for birthday presents to the few friends he kept in his later years. These minimal mentions fill less than two paragraphs. This 170-page book is heavy on speculation about the moody Yankee, but short on insight. Head to your public library. Check out Maury Allen’s 1975 book Where Have you Gone, Joe DiMaggio? Or, seek the 2001 Joe DiMaggio: The Hero’s Life by Richard Ben Cramer. Spend your money on stamps and envelopes. Write to baseball history’s survivors. It’ll be faster, more fun and offer better hope of getting original perspectives on this mysterious, pinstriped icon. Is that all you got out of this book? I understand collectibles are your focus, but I felt this book was a memorable study of everything about Joe’s and Marilyn’s inside lives. It was great to learn about how Joe rescued Marilyn and was the only one not to use her. I also loved the chapter on African American baseball players. 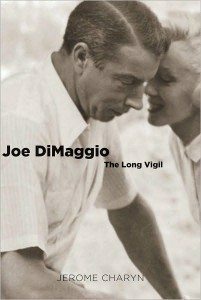 The author could have done so much more, showing how autographs (or lack of) represented DiMaggio’s attitude toward fans — his adoring public. For years, his sister ghost-signed his fan mail. Sorry, I’m still disappointed. Tom – thanks for your honest review and hosting a stop on the blog tour. It’s interesting to read everyone’s take on the book – some focus on the romance between Joe and Marilyn, some pinpoint the baseball moments like Joe’s 56 game hitting streak, etc. As a baseball collector, you zeroed in on Joe’s later years on the autograph circuit. There really is something for everyone in its pages. What “new” did this book bring to light that previous books haven’t? I’ve seen a lot of books lately about DiMaggio, Mantle, etc. that seem to be capitalizing on the name they’re writing about but offer little else in the way of new information. Tom, Jerome Charyn followers appreciate your having giving your thoughtful “take” on the book. Thanks for being a fan of Joe DiMaggio.